1) Provide the easiest access to pictures for both you and Nicholas when he wants to make a request. 2) Have Nicholas’ pictures out and visible to remind him of the choices he has availible to him when he is home. 3) Enable convenient manipulation of the pictures so you can easily remove pictures of items and activities that are not available to Nicholas. 1) When you recognize that Nicholas wants something, bring him to the Communication Board. He may point to/reach for an item (fritos, ipad) or verbally label it. Bring him to the Communication Board anyway. 2) Make sure the picture of the desired item is on the board. 3) Have Nicholas find the appropriate picture and take it off the board. 4) Have Nicholas place the picture on the sentence strip (the white square). 5) Have Nicholas find the appropriate verb card (eat or play) take it off and place it on the sentence strip (the white triangle). 6) Have Nicholas remove the sentence strip and give it to you. 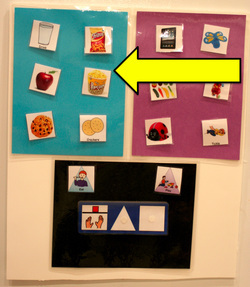 7) Review the sentence strip by pointing to the pictures and prompt him to speak the request. 8) Give him the desired item immediately. 1) Be aware of the pictures that are on his purple and blue sheets. Make sure you have available all of the items you put on the blue and purple sheets. Be sure to remove any pictures of items you can not give him. 2) Make sure that all desirable items are visible but out of Nicholas’ reach within the home. Place toys and snacks on high counter tops, high shelves, or clear containers that he can't open. 3) Keep items that you do not want Nicholas to have (i.e. lollipops) out of Nicholas’ sight and reach. 4) Try to use the communication board for all requests that Nicholas makes. 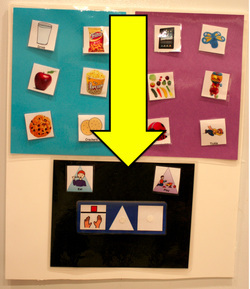 If he verbally requests an item or points to an item, bring him to the board and have him use the pictures and sentence strip. (this may seem tedious, but this routine will help expand and extend your interactions with Nicholas. It will also incorporate some much needed structure and routine into his time spent at home. 5) Encourage Nicholas to use speech with the sentence strip. It is a misconception that these strategies will hinder his speech development. They are to be used in combination with speech to reinforce functional communication (speech that has meaning). Why is using a communication board important? 1) It adds the structure to his time spent at home. Nicholas needs and craves structure in order to understand and navigate his experiences at home. 2) It enables Nicholas to follow a routine at home. This establishes predictability for Nicholas, which will reduce some of his frustration and acting out behavior. 3) It will increase his functional communication within the home. The more he uses this system, the more he will be able to make connections between communication and his surroundings (the objects, activities, and people around him). 4) It will increase and provide meaningful interactions between you and Nicholas, which can eventually be built upon. 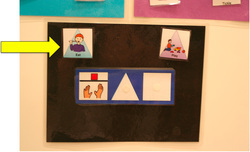 5) It introduces him to visual supports. 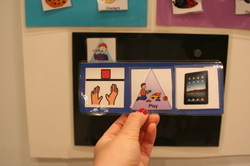 Visual supports are a very effective technique used to guide and provide clarity to children like Nicholas throughout their day. 6) It will reduce his tantrums when he is not given what he wants. He will learn that he has other choices. 7) It builds a foundation for developing both speech and language. 1) Place the Boards at Nicholas’ eye level so that he can access all the pictures. 2) Try to keep the Boards at their decided locations so Nicholas will know where to go if he wants to request something. 3) I have given you Command Hanging Strips. These will not damage the walls or furniture. They are used to attach the board to walls or furniture. This is for pictures of toys and activities that Nicholas enjoys. It holds 6 pictures. Anything that you place on this sheet, you will need to make sure is available for Nicholas when he requests it. For example, if the iPad is not charged make sure the iPad picture is not on the purple sheet. This way he will not become frustrated if he requests it and you can’t give it to him. Eventually this will also help Nicholas to understand that the options on the Board are what is available to him. If he wants something that is not on the sheet, he will better accept that he can not have it at that moment. This helps you to avoid situations where you have to say “no” to him. This is for pictures of foods that Nicholas enjoys. It holds 6 pictures. Again, anything that you place on this sheet, you will need to make sure is available for Nicholas when he requests it. 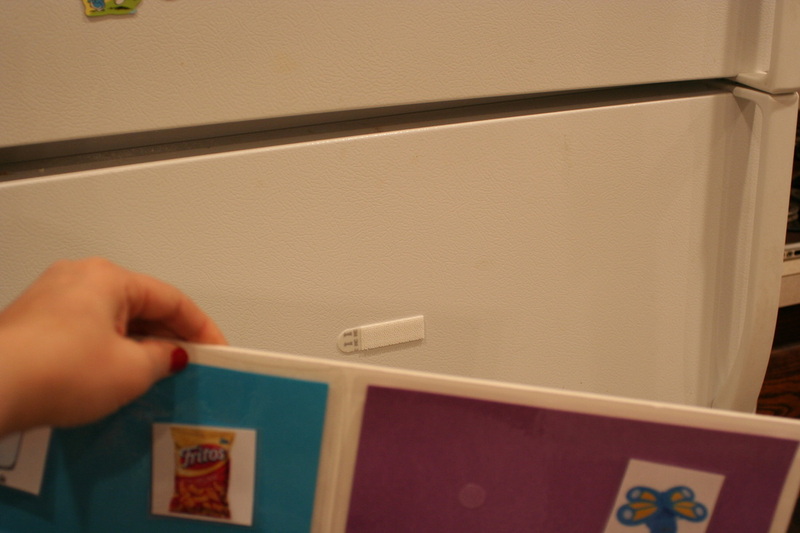 For example, if the you don’t have any more French fries in the fridge/freezer, make sure the French fries picture is not on the Blue Sheet. This way he will not become frustrated if he requests it and you can’t give it to him. 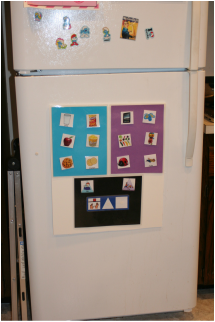 Pictures that you place on the Blue and Purple sheets will also remind Nicholas that he has choices. This way he will be less in a frame of mind where he thinks that what he wants he either “can have” or “can not have”. This will help to avoid frustration when he doesn't understand why he can’t have an item. This is the Sentence Strip Sheet. It contains a Blue Strip where he must place a picture of an action and an item he wants from you. Nicholas must give you the blue Sentence Strip in order to get what he wants. This process extends and expands his interactions with you. 1) Bring Nicholas to the Board when you get a sense that he wants something. 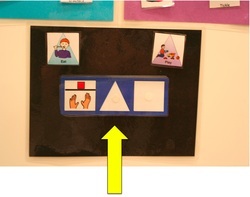 2) Help him to place the pictures on the sentence strip by guiding his hand with your hand. 3) Encourage him to give you the Sentence Strip by putting your hands out in front of you. 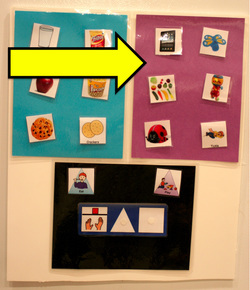 He will eventually learn to go to the Communication Board by himself and independently follow the sequence of : 1) finding the pictures; 2) placing the pictures on the Sentence Strip; and 3) giving the sentence strip to you. Both the Blue Sheet and the Purple Sheet are removable with velcro. 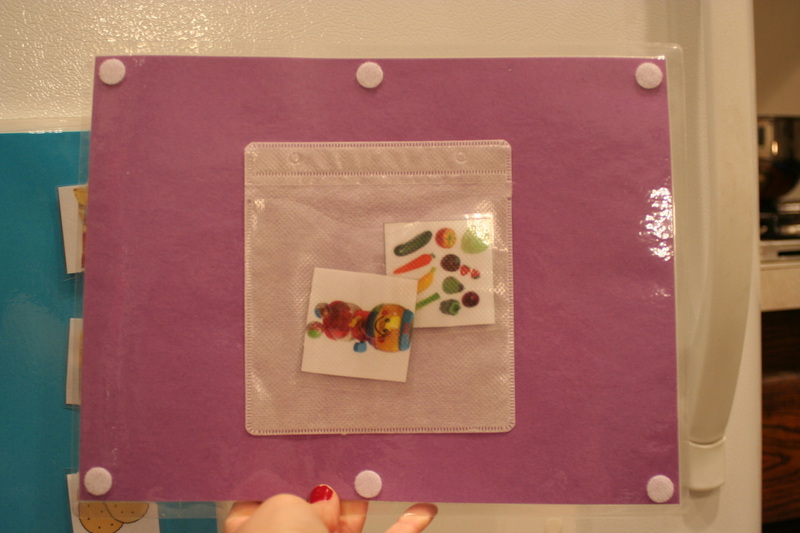 On the back of both sheets is a pocket where you can quickly place the pictures of items that are not available to Nicholas. 1. The “eat” picture corresponds with the Blue Board. The blue triangle on the picture and its placement under the Blue Sheet are visual hints/cues for Nicholas so that he knows if he wants something from the Blue Sheet, he must also use the picture with the blue triangle. 2. The "play" picture corresponds with the purple board. The purple triangle on the picture and it’s placement under the purple sheet are visual hints/cues for Nicholas so that he knows if he wants something from the purple board he must also use the picture with the purple triangle. The Sentence Strip is where Nicholas is to place his desired action and item. The white shapes will help him to differentiate the action picture from the item picture and insure the correct sequence of pictures. Nicholas uses a Sentence Strip in school and at home. It has been observed that he experiences some confusion about what to place on the Sentence Strip. Hopefully these visual hints/cues will guide him to the correct process and we will then eventually remove the hints/cues. Once Nicholas has placed the pictures on the Sentence Strip (with your help at first), he must remove the Sentence Strip and give it to you. · Take the Sentence Strip from Nicholas. · Be at eye level with Nicholas. · Point to the pictures and read the Sentence Strip. 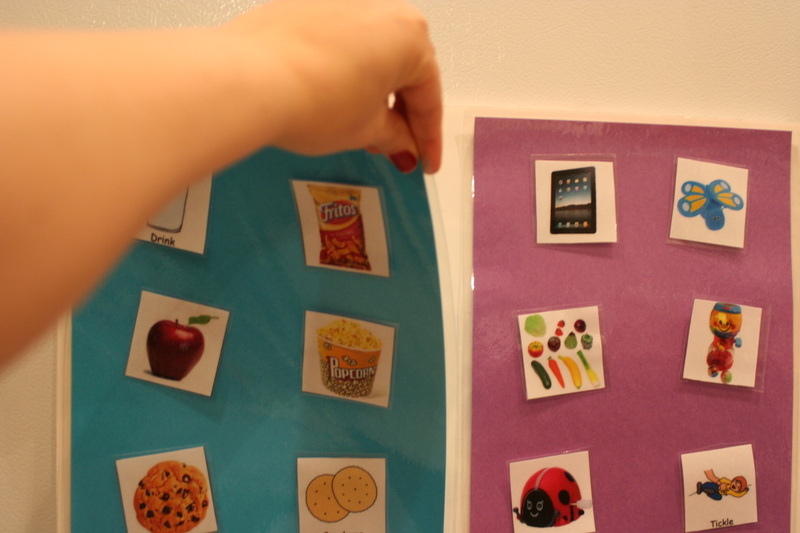 · Encourage Nicholas to read the Sentence Strip and/or point to each picture on the Strip. · Give him what he is asking for as soon as you can. and be more likely to ask for the items again through this process. On the back of the large white board is the place to store pictures that you are not using. The pictures attach with velcro and make it easy for you to see all the pictures you have at one time.